Meghan Markle is settling into her role as a Royal, and she looked chic and sophisticated in white Givenchy at the 2018 Royal Ascot. See her outfit below! Meghan Markle, 36, wore white Givenchy — the same designer as her wedding dress — for her debut at the Royal Ascot on June 19. The Duchess of Sussex rode in a carriage with her husband Harry, The Duke of Sussex. They sat alongside Edward and Sophie, the Earl and Countess of Wessex. The Queen and other members of the royal family were present as well. 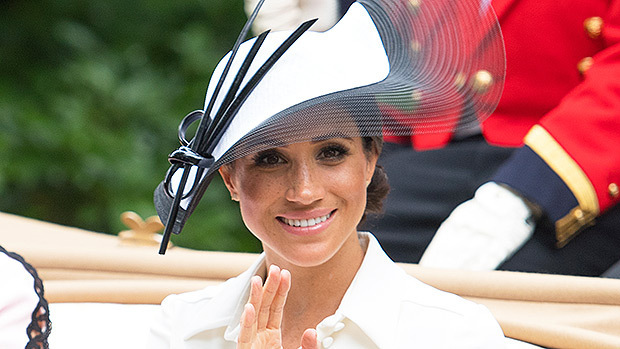 Meghan wore a black and white Philip Treacy hat and wore her hair in a chic, low bun. She carried a black clutch, and wore a black belt, and black pumps. Meghan’s makeup was gorgeous. 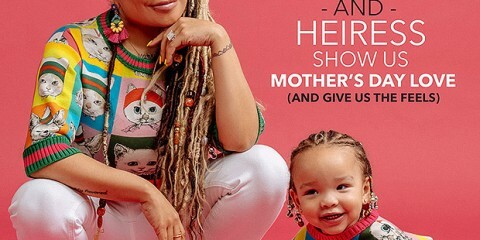 Her skin was glowing — she’s developing a signature style of her own. She looked so natural, with her amazing freckles on full display. Her skin looks flawless, and she is barely wearing any makeup! She defined her eyes and lashes with liner and mascara and popped on a pink lip. Radiant! Less than a month after the royal wedding, which was watched around the world, Meghan seems to be settling into these Royal Engagements nicely! Meghan just wore a blue and white Oscar de la Renta gown while attending the wedding of Princess Diana‘s niece, Celia McCorquodale to George Woodhouse at St Andrew & St Mary’s Church in England on June 16. It was actually similar to a dress Diana wore back in 1986. We hope she continues to pay homage to Harry’s late mother!